One impact of climate change is an increase in frequency of extreme warming events. Marine heatwaves are globally increasing both in duration and intensity. Heatwaves are a prolonged period of very hot weather. These increases in duration and intensity have devastating impacts on marine ecosystems. As the climate changes, it is important to keep track of the impact of these changes on marine life and its habitat. This way, we will know what is happening and what will continue to happen to fish and shellfish, a staple economic product and protein source for many regions around the world. The Tasman Sea off southeast Australia experienced its longest and most intense heatwave in 2015/16 austral summer. Sea surface temperatures were 3-4 °C above average. 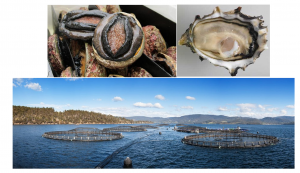 This temperature spike negatively impacted aquaculture industries along the Australian coast, including abalone, salmon, and oysters. Increases in temperatures can make marine liffe more susceptible to diseases and alter their free available energy for survival. Recent research focused on the Tasman sea heatwave event, from the physical drivers to the ecological impacts. Through a series of models, the researchers found that anthropogenic climate change increased significantly the chances of this marine heatwave occurring. Overall, the ecological impacts of this heatwave were mostly restricted to sessile (immobile) animals such as oysters and abalone. The mortality of these animals increased and/or the condition worsened following the heatwave. Abalone, oyster, and salmon aquaculture from Tasmania (Dr. Eric Oliver). Beyond aquaculture, the heatwave was also associated with reduced condition of Atlantic salmon as well as observations of fish species beyond the range where they normally occur. These observations of different locations for fish included yellowtail kingfish, snapper, dusky morwong, mahi mahi, blue moki and moonlighter fish. 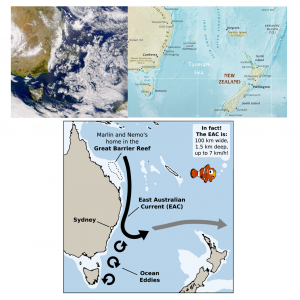 The researchers hypothesized that these fish were carried further south by a local current, called the East Australian Current Extension, acting stronger than usual. These changes in fish distribution can alter the fishing industry – it results in changes in steam time (time fishing boats need to arrive at fishing locations), potential changes in gear needed, hours spent fishing, and the amount of money required to fish. These changes may occur as a result of these changes in fish locations due to the fish leaving the area where fishermen can reach and needing to switch to a different species, or the fisherman continuing to fish that species but needing to spend more money and time to reach the fish. The authors conclude that marine heatwaves can impact both wild fisheries and aquaculture, making it valuable to understand these changes to be able to support adaptive management for these valuable resources and habitats. Dusky morwong (left; Wikimedia Commons, Peter Southwood) and moonlighter fish (right; photo on FishBase by Brennan, Michael).